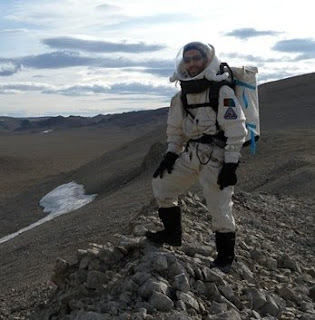 In July 2009, I was a crewmember on a month-long simulated Mars mission to the Flashline Mars Arctic Research Station (FMARS) on Devon Island in the Canadian Arctic. Throughout the Mars Society sponsored expedition, I posted regular dispatches from the field to my website astronautforhire.com. 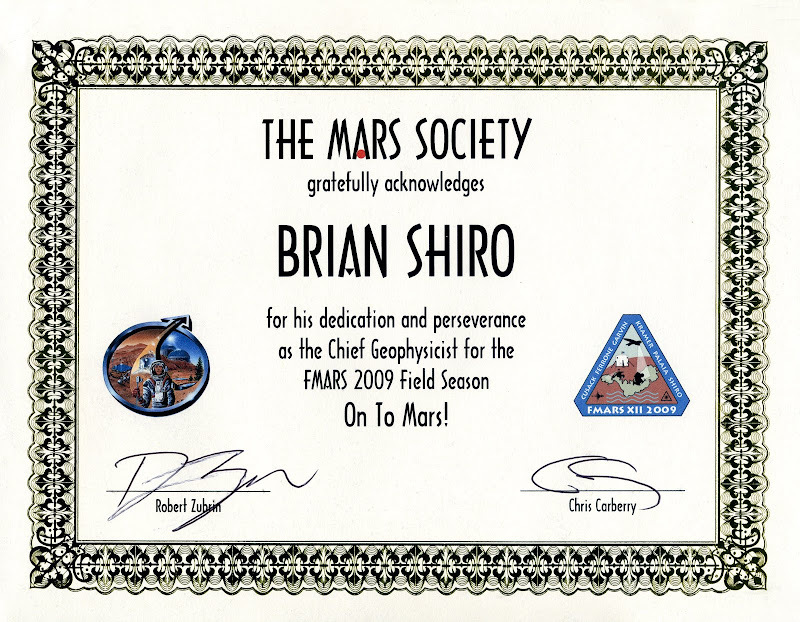 I've collected all of these "letters from Mars" on this page for easy reference along with my video blogs and news articles featuring me. Photos are available on my Phanfare site or the FMARS Crew Picasa Web Album site. Please contact me for media inquiries or to ask permission to use a photo. Thanks to everyone who followed me during the mission, especially those who chipped in to help pay for my expenses. On to Mars! 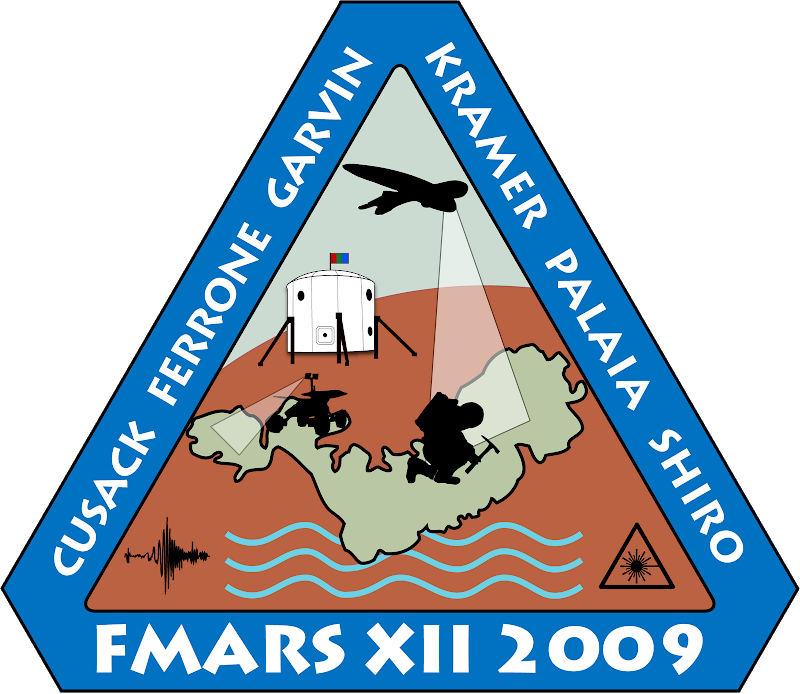 FMARS-XII Patch I designed the FMARS patch with the help of my wife and fellow crewmembers. It is triangular in shape to convey the theme of prospecting for resources via three vantage points: air, surface, and subsurface. The shape is also reminiscent of the petal/airbag structures employed by Mars landers of recent years. The patch features an image of Devon Island (light green) superimposed on Mars to indicate how the the island is considered a Mars-like analog environment. An astronaut geologist and rover are featured on the island, and the unmanned aerial vehicle (UAV) flying overhead is showing the geologist where to dig. The blue wavy lines beneath the island signify the geophysical search for groundwater done at FMARS this summer. The water image is flanked on the left by a seismogram and right by a laser symbol to reference seismic and biomedical research projects. In the background is the FMARS habitat (the "Hab") proudly waving the Mars flag.